Join us at Ham Lake Community/Senior Center every Monday from 9-10am for a fun and interactive group exercises class for all fitness levels! This class is FREE and perfect for older adults, individuals with physical impairments or anyone looking to get out and meet new people! 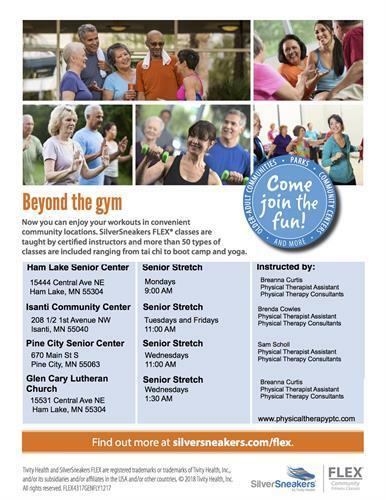 PTC is now partnered with Tivity Health for offer SilverSneakers FLEX classes. You do not have to be a SilverSneakers member to participate. If you would like more information, email Breanna Curtis at bcurtis@physicaltherapyptc.com. Tivity Health, SilverSneakers and SilverSneakers FLEX are registered trademarks or trademarks of Tivity Health, Inc. and/or its subsidiaries and/or affiliates in the USA and/or other countries. © 2017 Tivity Health, Inc. All rights reserved.